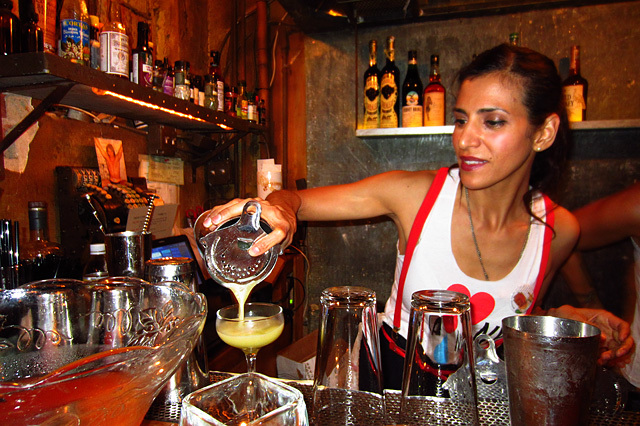 Last month, Los Angeles bartenders gathered with friends and family from the cocktail community for LA Hearts NY, an event “By Bartenders for Bartenders” that raised funds to help those affected by Hurricane Sandy. Earlier this week, it was confirmed that the event, which took place in the R&D Bar at Harvard & Stone, raised $5000 for the New York chapter of the United States Bartender’s Guild (USBGNY). Given the scope of the devastation, time was of the essence. LA Hearts NY quickly went from an idea to reality in a few days, thanks to the efforts of organizers Cari Hah, Jaymee Mandeville and Zahra Bates. Product and monetary support was provided by Wild Turkey, Corralejo Tequila, Fernet-Branca, Tequila Ocho, Sailor Jerry Rum, Novo Fogo Cachaça, Fords Gin, Karlsson’s Vodka, and Leblon Cachaça. Offers to help with the event came from throughout the city, including volunteers Christine England (The Pikey) and Caña Rum Bar GM Allan Katz. 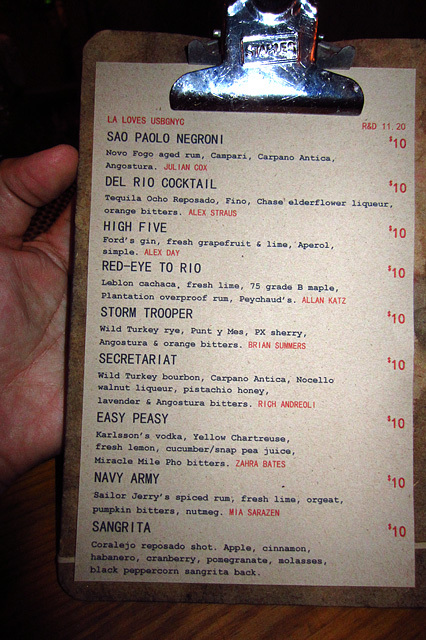 The longest menu in R&D Bar history featured the sponsoring spirits and cocktail recipes contributed by bartenders from across the city. 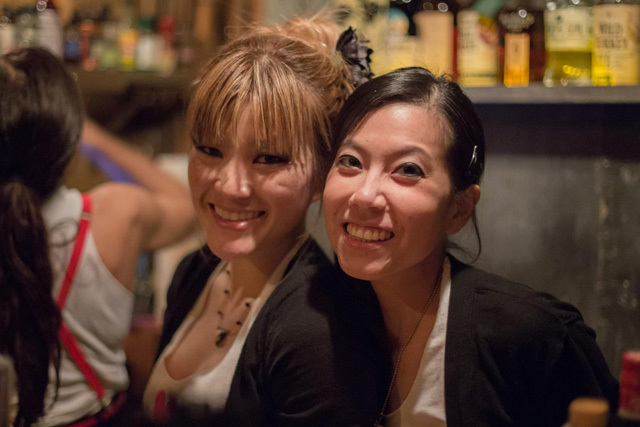 The R&D tagteam bartender session featured the LA Hearts NY power trio along with Mia Sarazen. 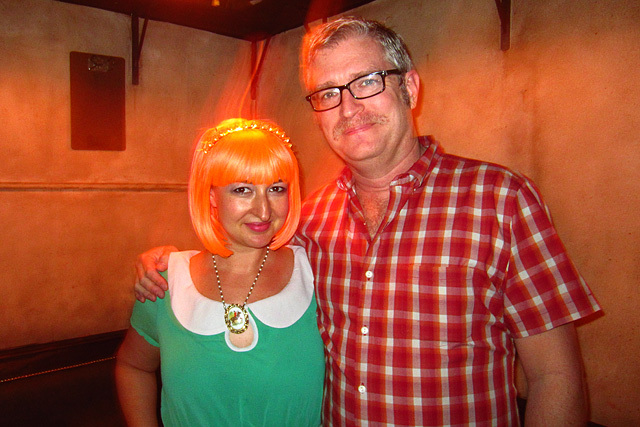 Hollis Bulleit and Dave Stolte, seen here in full Movember mode. The $5000 was raised through a combination of proceeds from the R&D Bar, other cash sales and a silent auction. LA Hearts NY set up in the adjacent private room, where the fabulous Hollis Bulleit offered sips of something “super sneaky special from the distillery” in exchange for a cash donation. More donations came from sales of t-shirts with the LA Hearts NY logo designed by Home Bar Basics author Dave Stolte. The shirts were quickly turned around by the Ultimate Shirt Company and made possible by generous donations from Karlsson’s and Leblon. And lest we forget, Fernet laybacks were administered in the R&D for any cash donation. 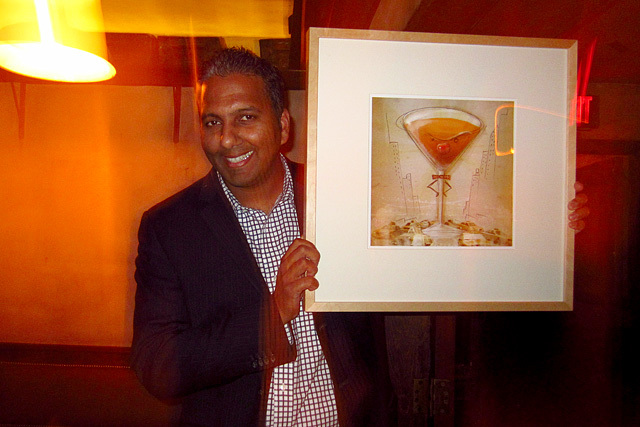 Nishant Narayan with Dave Stolte's Manhattan cocktail print. One of the top silent auction winners was Sporting Life regular Nishant Narayan, who took home an exclusive set of Miracle Mile Bitters, a framed cocktail print of a Manhattan by Stolte, and a gift basket with Highland Park 18, Macallan 15, Brugal 1888, and Black Grouse. 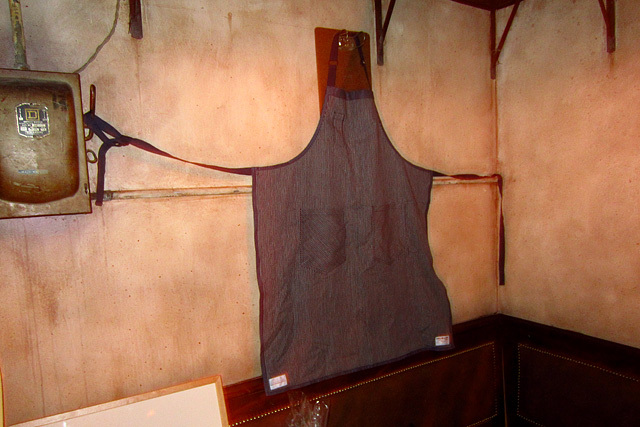 A bespoke Hedley & Bennett apron, handcrafted from recycled Japanese denim. Another generous bidder was Ron Dollete (Lush Angeles), who won a bottle of the upcoming La Niña del Mezcal, bottles of Noilly Prat Ambré (unavailable in the US) and Drambuie 15-Year Speyside Malt Whisky Liqueur, and a $100 gift card to Osteria la Buca. Other items included a special bottle donated by Del Maguey Mezcal, and a bespoke Hedley & Bennett apron that was won by Marcos Tello (Tello Demarest Liquid Assets). Time and again, the Los Angeles community has stepped up to support a worthy cause, whether it was Art Beyond the Glass this past summer or the recent Murray Stenson fundraiser in October. However, as fantastic as it is to raise $5000 for New York, Hurricane Sandy impacted two dozen states in some way, and its effects are still being felt as this post goes live. Weeks after Sandy ravaged the East Coast, tens of thousands are still without power or heat. The death toll is 253, and damage is estimated at over $65 billion, making Sandy the second-costliest hurricane in US history. For millions, Sandy’s aftermath will last a lifetime. As we enter the festive holiday season, keep in mind that numerous organizations are accepting donations for ongoing Sandy relief efforts. For the first time in its history, Doctors Without Borders/Médecins Sans Frontières (MSF) set up a US medical clinic in the wake of Hurricane Sandy. Although MSF is not currently seeking donations for its Sandy relief efforts, it’s an organization that I support for its international humanitarian work.